A while back, I bought a small vintage case stocked full of vintage buttons and I have been having fun with button crafts ever since. I especially like the old mother of pearl buttons or the rich dark brown rustic looking ones. Old buttons are quite easy to find too at most antique shops. Other places to look are estate sales, resale shops, flea markets and garage sales. Of course you can also just clip buttons off of old shirts, that can no longer be worn, and start your collection that way! There are so many things you can do with buttons and jewelry is just one of them. This button bracelet is super easy with a chain containing flat round discs. Some bracelet chains come with the clasp and round already attached and only need the length adjusted with pliers to remove a link or two. However, if make the bracelet from a long line of chain, you will need to first cut the chain to size with tin snips. Attach the clasp and round to opposite ends of the chain if you need to add your own. Glue buttons to the flat round discs with jewelry glue. Another fun thing to do with buttons is to spell out words on labels or any other type of craft project. With this bucket, I just glued a section of burlap to the bucket to use as a base for the button word. Then, I outlined in pencil the word I wanted to spell and glued on the buttons. Buttons make a great replacement for digits on a clock. 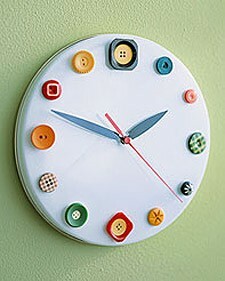 This craft idea by Martha Stewart would be a fun one to try with a variety of different button patterns and sizes. I may make one with burlap around the base and use my brown buttons for a more rustic looking clock. Here is one I found on Pinterest. 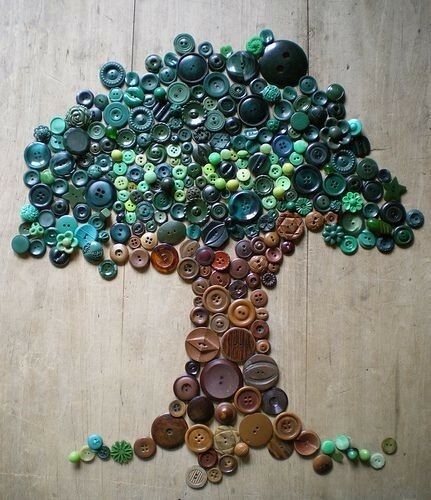 You can create all kinds of art if you have a large supply of colorful buttons. Attach the buttons to wood, canvas, or burlap in a frame for some fun wall art. Monograms are really popular too, which you can do in buttons of all one color. Salvaged Grace came up with a fun way to use buttons in lighting. What a great way to spruce up a boring lampshade! You could even use all of the same color buttons for a more subtle look and still get a lot of textural interest. 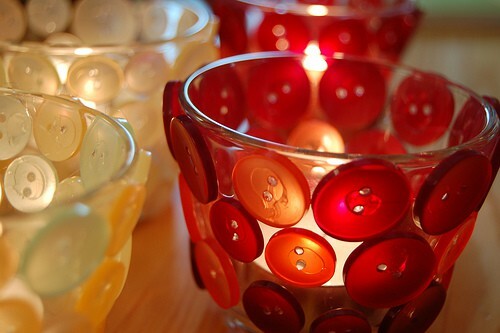 A glowing candle sets off these button votives by Ihanna just perfectly. 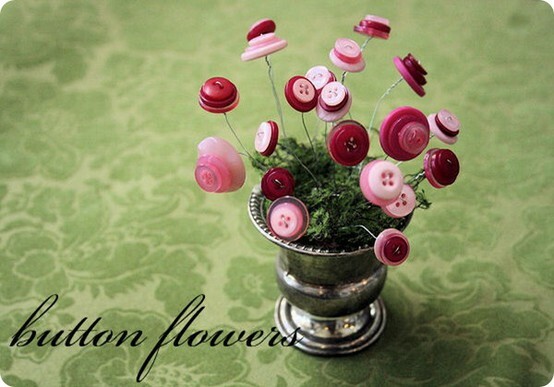 These button flowers by Jones Design Company look quite elegant in their silver container. I love the fun artsy look. 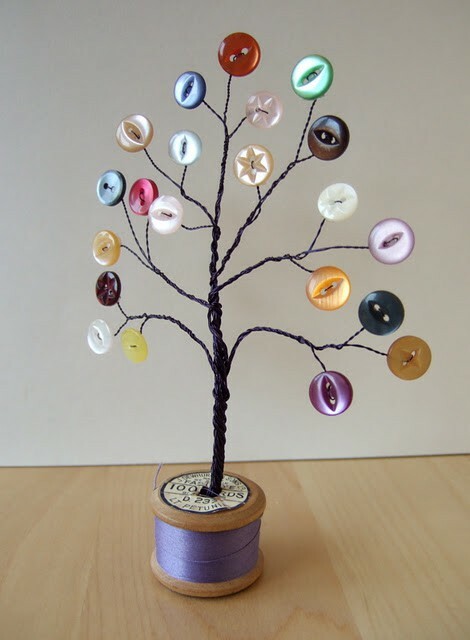 This button tree, on a thread spool base, by Kitsch And Curious is just so cute. It would be a fun accent in a craft or sewing room. 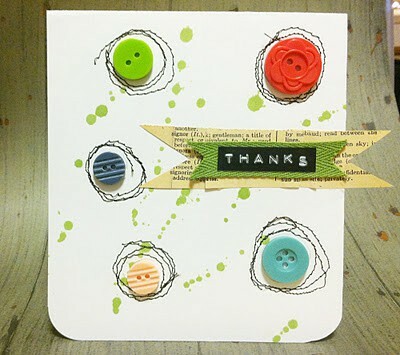 Use buttons to embellish cards or other paper crafts like Tiny Natt did. 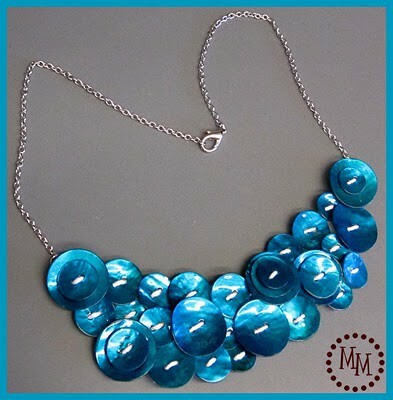 Finally, Michelle from The Scrap Shop shows you how you can make a button bib necklace with shell buttons that you can purchase inexpensively. What types of crafts can you think up? What do you think of this list of ideas? Let me know your thoughts — I love to hear from you! I love this! Just finished a lamp shade with buttons and have decorated winter dcarves with them. Great! 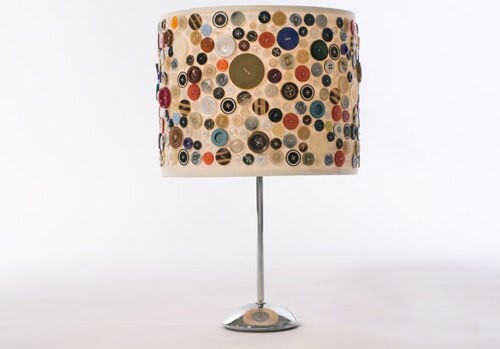 A button lampshade is such a fun look! Can you please tell what kind of wire it is that you used.